Update: The Denmark team took the gold medal in this year's contest. See here for more photos of the event. 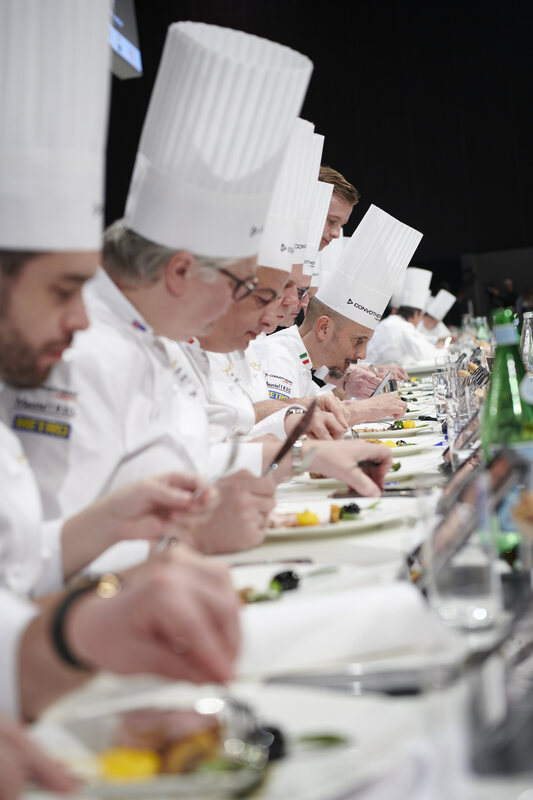 The first day of judging started for 12 countries at the Bocuse D’or culinary contest on Tuesday, Jan. 29 at the Sirha show in Lyon, France. The U.S. team won its first ever gold award in the last competition 2017, so all eyes were on the defending country, this year represented by head chef Matthew Kirkley, formerly of Coi in San Francisco, Fat Duck and Le Meurice, and Mimi Chen, formerly of the restaurant Daniel, as commis. Sixty-seven countries competed for the 24 spots for the final competition. For the first time, African countries were included in the contest — Tunisia and Morocco. 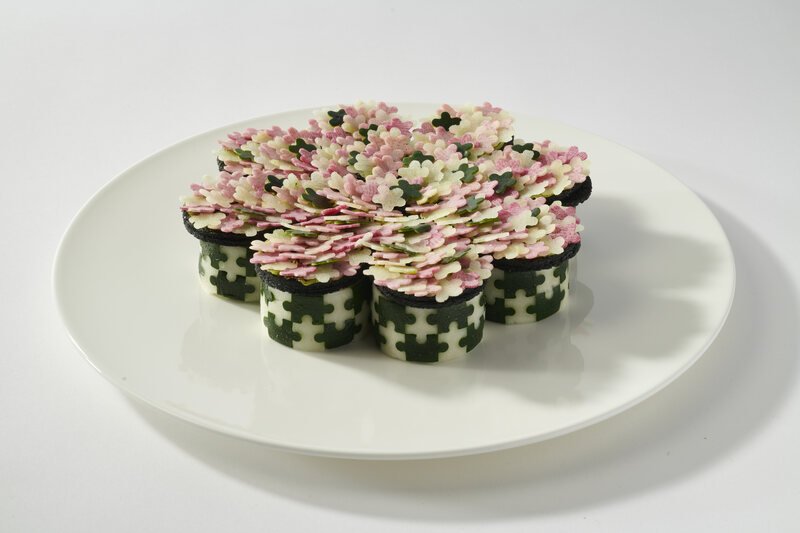 The themes of the platter and plates tie back to the sensibility of the competition’s founder, celebrated chef Paul Bocuse, who passed away in 2018 at age 91. 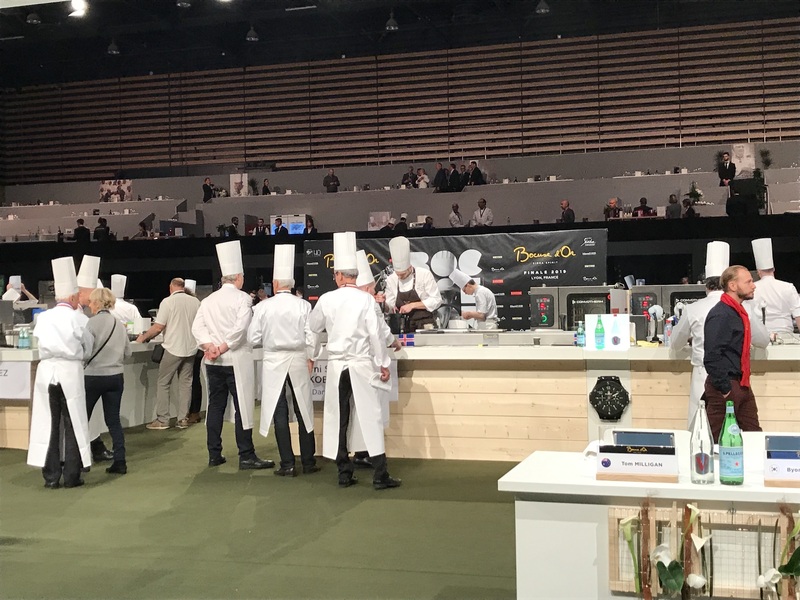 “This year the International Organizing Committee is keen to place some of the culinary fundamentals at the heart of the contest as a tribute to Paul Bocuse, founding father of the competition, to ensure that the performance is after the image of the atmosphere that reigns in the kitchens: a subtle mix of perfumes, fragrances and sounds of cooking utensils but also the right combination of perfect know-how and creativity,” the committee said in a statement. For the platter, the contestants must make a roast veal for 14 people in 5 and a half hours with three mandatory garnishes and one sauce or gravy. “This is a fascinating challenge that requires extracting the best from the product while transforming the piece into a perfectly mastered and most delicious dish,” said Jerome Bocuse, president of Bocuse d’Or and the son of the late namesake chef. The plate needs to be a version of the classic French dish — a vegetable chartreuse, using seafood, sauce/gravy, vegetables and aromatic herbs. The U.S. team’s chartreuse dish caused a stir in the crowd during its unveiling because of its composition. The pieces fit together like a puzzle and didn’t need any cutting. The announcer at the competition said that the meals must be somewhat contradictory things all at once: traditional, innovative and yet have a twist that reflects the team’s culture. The culture can be subtle, for instance, the U.S. platter used Napa Valley ingredients. The 1,300 person crowd was divided by country and each took turns in cheering their teams with songs, a brass brand (the UK), air horns and confetti cannons with flags (Denmark). When announcing the competition’s judges, the crowd went wild for California chef Thomas Keller. 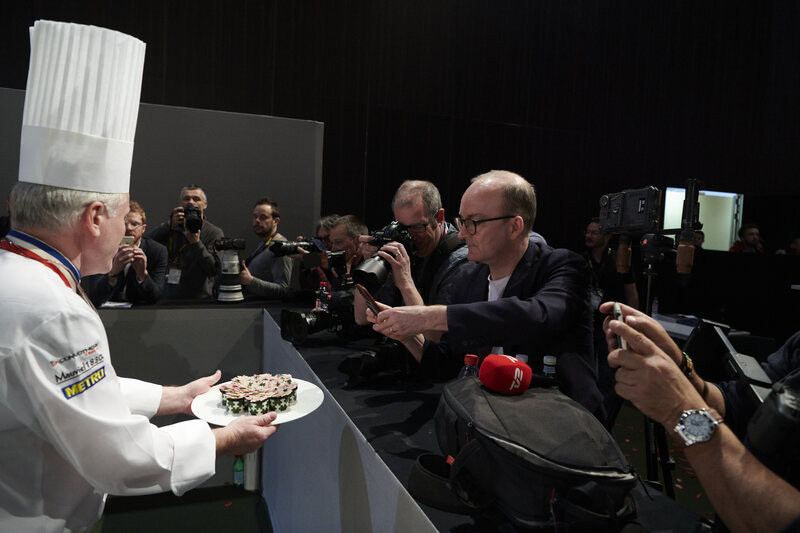 There was a crush of press covering the competition, including the opening ceremony where the chefs “shopped” for some of the ingredients on a market on the Sirha show floor. The 32 person jury is broken into eight judging the kitchen, 12 judging the platters and 12 judging the plates. Of the jury, only one is a woman, chef Giovanna Grossi from Brazil, and of the contestants, only two — Natcha Saegow of Thailand and Seon Yeong Gu of South Korea — were women. The kitchen jury looks at method, technique, and use of products and the tasting portion of the jury judges the dishes based on presentation, originality, garnishes, sauce, taste, seasoning, texture, and visual appearance. The most recent Bocuse d’Or gold winner — Matthew Peters, the first U.S. chef to win gold in the competition’s 32 year history, — is the jury president. The final competition on Jan. 29 and 30th follows 60 national selection rounds and four “continent” competitions that winnowed down the 67 competing countries to the final 24. The preparation is extensive, with the commis, chef and a coach working for a year and a half in advance of the competition. This year’s coach is Robert Sulatycky of the Four Seasons group and former Bocuse d’Or representative of Canada. The final winners will be announced in the evening of Jan. 30 in Lyon. The first prize winner receives 20,000 euros, on top of international recognition. Second prize receives 15,000 euros and the third 10,000.